When a special friend or family member, or even a co-worker does a truly good deed for you – return the favor. Give our thank you gift basket with gourmet, sophisticated, and satisfying pairings of San Francisco-crafted Volpi® Italian Salame with premium Cheeses from the fertile California wine region. Expertly created, hand-tied Volpi® Italian Salame perfectly complements the Fiscalini Cheddar and Sierra Nevada® Goat cheeses that are made using time-honored traditions and techniques. Sierra Nevada cheese combines the perfect mix of lavender and fennel pollen which gives this fresh California artisan goat cheese a sweet flavor. It’s a delicious gift worthy of a very special someone. When a special friend or family member, or even a co-worker does a truly good deed for you – return the favor. 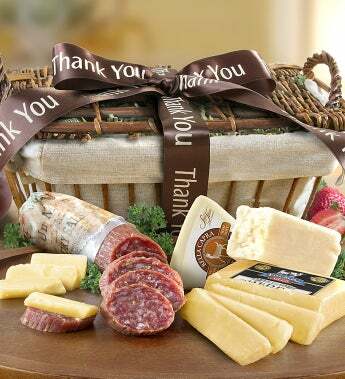 Give our thank you gift basket with gourmet, sophisticated, and satisfying pairings of San Francisco-crafted Volpi® Italian Salame with premium Cheeses from the fertile California wine region.